Enjoy the outdoors. A new deck gives you a great space to enjoy the outdoors, entertain friends, or relax with the family. Decks have always been popular, and it's easy to understand why. These home additions offer an attractive, affordable way to expand your living space and connect with the outdoors. If you want a new deck, Arrow Renovation has the experience and skill to design the perfect space and complete the construction process from start to finish expertly. We will work with you to develop a design that matches your home, fits your needs, and will last for years to come. If you want to add a deck to your home, call us today at 1-855-251-7315 or click below to get started with a free estimate. Our deck construction services are available throughout Greater Kansas City, including Prairie Village, Leawood, Lansing and nearby. More economical: Paying an independent architect or designer usually makes a deck design project more expensive. More choices: The combined knowledge of design & construction professionals means that your deck project can incorporate the details you've been dreaming about. You get a customized design that represents the best possible value. Beauty, function & durability. Your deck project can be a customized design that incorporates all the right features and is built to last. 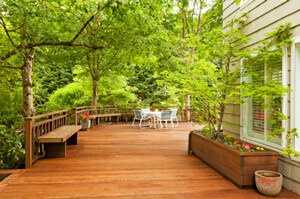 We can build your deck with all the right features! The first step in your deck building project is also the easiest! Simply call us at 1-855-251-7315 or contact us online to schedule a free design consultation and estimate. Arrow Renovation is ready to work with you and bring your remodeling dreams to life. Call us today to get a free estimate on all our deck services in Prairie Village, Leawood, Lansing, Less Summit, Olathe, Overland Park, Shawnee, Lenexa, Raymore, Kansas City and throughout the surrounding areas.